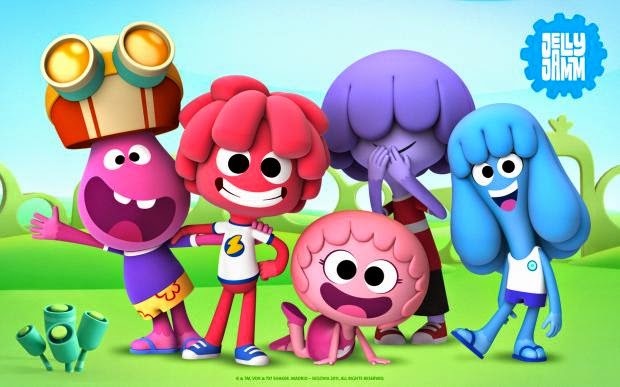 Channel 5 Milkshake broadcast a lovely animated series named Jelly Jamm where your little ones can explore the planet of Jammbo and watch friendships develop with each fun episode. It's suitable for children aged 4-7 years of age but the characters are rather cute and comical so I don't object to watching this sometimes myself too! There is some rather energetic music to get the Mini Mes up and dancing throughout and it teaches important life sessions which is definitely a bonus. The kids can learn while being active, a win win situation. The show is produced in Spain but shown in over 180 countries worldwide; that's quite some audience. With the release of a new soft toy range from Bandai it's definitely a time to celebrate with Bello and chums, even more so because we have a wonderful giveaway for you too! This collection of merchandise is perfect for any fan. For your chance to win a Jelly Jamm bundle of goodies, which are perfect to pop away for Christmas, you can enter via the Gleam entry form below. Leaving a comment on this post is a mandatory entry method but there are extra methods available also. The giveaway ends on 17th October 2014 at 11.59pm GMT. My youngest daughter is forever singing Cauliflowers Fluffy! It is a lovely song that they are learning at school for their Harvest Festival! Let it go from frozen for my daughter and for my son round the garden! My son loves all the songs from Frozen! Let it Go from Frozen at the moment! My daughter's favourite song is between 'Roar' by Katy Perry and 'Let It Go' from Frozen! My daughter is obsessed with baa baa black sheep right now! Let it go - Frozen, but I am fed up of hearing it now! smurfs go pop album, classic!! Let it go - but in a high pitch voice all the way through! Everytime I see my little cousins they give me a rendition of Let it go! my son is always singing bob the builder! My son loves The Wheels on the Bus, but he changes it to The Wheels on the Train, because he's a little train obsessed! My daughter loves Twinkle Twinkle Little Star...and when we are in the car, we have the Frozen soundtrack on repeat & they both LOVE Let it Go! my daughter makes up her own songs mostly, the latest being one called 'the castle song'. I'm not surprised really as me and my husband are both musicians! Old macdonald, although its more like a zoo than a farm! My son loves Crazy Nights by Kiss !!!! The spiderman theme tune! he goes mad for it lol! My youngest loves 3 Wheels on my Wagon, this being the song that grandad is always singing. the wheels on the bus, everyone on the bus gets deafened with my 2 babies singing wheels on the bus and doing the actions, every time! its quite cute but it gets old after a while! At the moment my daughter likes "How do you know" from Enchanted and my son likes "Colours of the Wind" from Pocahontas but this changes daily!! The Doc McStuffins theme tune! At the moment it is "The Wheels on the Bus"
my son currently loves Billionaire ! or the lazy song , massive Bruno fan ! Let in Go from Frozen. My niece and nephew love "Let It Go" from Frozen. frozens do you want to build a snowman! Let It Go from Frozen! Horsey Horsey is a definite favourite along with the trotting actions! Thomas and Friends (Thomas the Tank Engine), theme song.